On Wednesday, October 24, students from the Aliwen College of Valdivia visited the RLC Campus at the Faculty of Economics and Administrative Sciences (Facultad de Ciencias Económicas y Administrativas), to learn about the work of the the Right Livelihood College programme as well as the Right Livelihood Award Foundation. Two Colombian Master’s students of the Human Scale Development and Ecological Economics programme at the RLC, taught the students about their research and the importance of the Right Livelihood Award. They shared their personal motivation to apply to the Master’s programme in Chile, and presented the RLA-awarded ideas of the Chilean Economist Prof. Manfred Max Neef; the theory of Human Scale Development and other ways of understanding the economy as a discipline that should be at the service of life and people, not the other way around. This Aliwen School activity was part of an environmental awareness week. 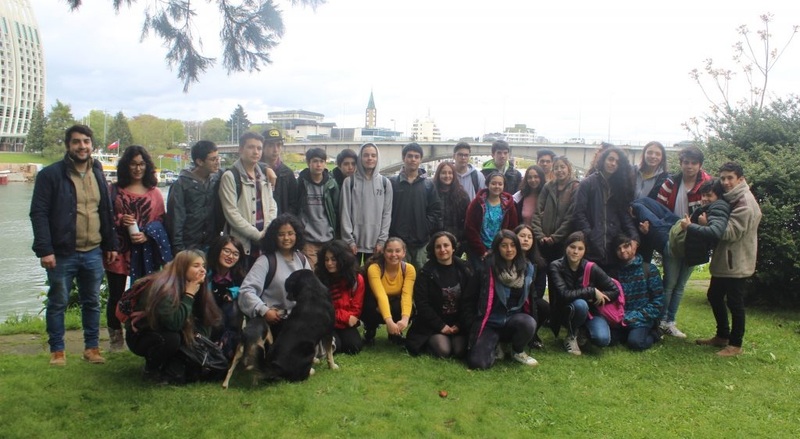 “We are very happy to be able to have this opportunity, since we want to know different social and environmental problems in order to generate awareness in the students to quickly form an Environmental Action Plan”, said Prof. Francisca Puentes, teacher in charge of the programme. Read the original Spanish article here.